Did you know you can review all of the changes that were made to a Google Doc that you own or have editing privileges to? 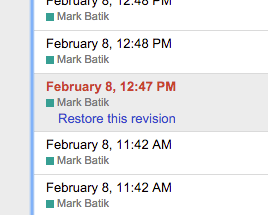 Did you know you can revert to any of those changes if something done later was made in error? Did you know you can review the progress (or lack thereof) that a student or group of students has made on a shared document? 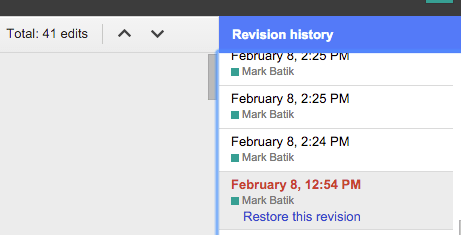 You can accomplish all of this using the revision history history feature in Google Docs. To see all of the changes that have been made to a document, click the last edit was made link next to the menu items. This will bring up a new screen that has a sidebar on the right of all of the changes that have been made to the document. The changes come in two levels. You can look at either the changes that a person made while they were working on the document, or you can look at a detailed version of every edit that they made during that session. You can change the level of detail by clicking the show more detailed revisions button in the bottom right corner of the screen. When you select one of the changes from the sidebar, you will be given the option to revert to that version by a link that will appear under that person’s edits. Additionally, when you click on one of the edits, you will also get the ability to scroll through all of the revisions that they made. A Total bar with up and down arrows will be available to the revision history sidebar that allows you to click up and down through the edits that were made in that session. The major use of this is to restore previous versions of documents if important information has been changed or lost in the process. Another use can be to go through the changes that a student or group of students made to a document. This might help you document the veracity of a student’s claims that they didn’t have enough time to work on something or that one or more students were disruptive or did not contribute much to the document.